Coach’s Corner: The Best Test Series – Good is the Enemy of Best! Are you or the people in your company settling for “good enough”? This video shares some insights on how to keep getting better at all you do. Be careful you don’t go back to being good by becoming complacent. You have to keep striving to get better. By continuing to keep learning. We stop inspiring other. Or who we hang out with changes. Remember that who you spend the most time with greatly affects you, your business and your relationship. This reminds me of the blog I did awhile ago on Your Top Five Friends? Focus on why you got in your business in the first place. Hopefully this will inspire you to get focused and serious about your business again and help your Team catch the vision that you started out with. Watch this vide and go out and #BuildRealValue today in all that you do! Let me know if we can help you in any way in getting better at all you do! "Dan is not just a teacher and coach. He has walked in your shoes. He has done it from the ground up! If integrity, innovation and profit making are your goals then pay attention and don't hesitate when opportunity knocks." 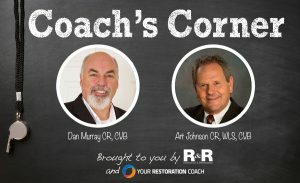 © 2019 Your Restoration Coach. All rights reserved.